Upstream or Downstream with nymph while fly fishing, also for Steelhead? Nymphing - Upstream or Downstream while fishing for Grayling, Trout or Steelhead? 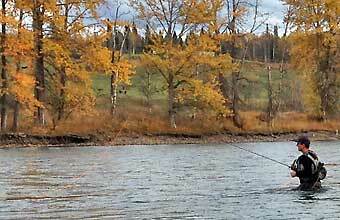 Upstream nymph fly fishing at the Bulkley river, even also for steelhead. Using nymph on a long leader is very successful. This question is answered the instant you see a live nymph rising to the surface. For example, take the Bulkley or the Bow River in Canada. Even in stretches where these rivers flow at a moderate pace, especially near the shore, I have never caught sight of a nymph rising to the surface upstream. In fast waters it is of course utterly impossible for a nymph to rise against the current. Even fast swimming nymphs (see also next chapter) are unable to achieve that. Reasoning from there: the imitation closest to the original is a nymph drifting downstream. We call this presentation "Dead Drift". If you want to render it more active, you may use the ever slightest stops or small vibrations in the tip of your rod. The biggest risk is overplaying this action. Slighter is better! Why then do anglers catch fish nymphing downstream? I should like to point out the difference between imitational value and trigger value. A fly of whatever kind, moving a relatively high speed, triggers different instincts than a fly presenting a particularly good imitation. To survive, fish need to eat. If they don't or if they take too long to decide, they will lose weight and eventually die. The older the fish, however, the more experience they have acquired, and the less likely they are to be fooled by a fly moving in a suspicious way. As a result, fish caught on nymphs fished downstream are usually considerably smaller than those caught nymphing in dead drift. As usual, we have an exception: you may stop your line after a long drift, letting your nymph thus swing to the surface. If the drift has been fished correctly, the nymph should be upstream from the end of our fly line and the leader when you stop the line. The nymph will then first accelerate downstream and start to rise towards the surface. This effect is much closer to the normal behavior of a nymph in flowing water. Another important measure will cut the pull the current exerts on your leader as it sinks in half. Let´s look at the hydrodynamics of your system, consisting of strike indicator, leader, and nymph. As described previously, we cast upstream and have the current transport the whole system towards us. Immediately after the cast, the nymph is the farthest upstream, followed by the leader, the indicator, and finally the fly line. Now if the line is carried directly towards the angler (more precisely towards the tip of his rod), the pull exerted by the current works only on the open end of our contraption, i.e. the end with the nymph, as the side with the angler at the end will not yield. Now the trick is to mend a loop pointing downstream into your fly line (see photograph). This way the pull of the current will now work on both ends of the loop, which cuts the pull on your nymph in half. This allows for a much longer dead drift of your nymph and gives it more time to charm a fish.